In patients with interstitial lung disease (ILD), nocturnal oxygen desaturation is associated with poorer quality of life and may contribute to long-term vascular stress. Nocturnal desaturation is thought to be common in ILD patients, with previous studies reporting its prevalence at 50–88%. Aim: To determine the prevalence of nocturnal desaturation in ILD patients and in the subgroup of patients without resting or exercise-induced hypoxia. Methods: We reviewed all ILD patients (n = 176, mean age 57.8 ± 13 years, 97 male) who had undergone overnight oximetry during 2005–8. All patients had pulmonary function and resting oxygen saturation (SpO2), and 125 had 6-minute walk testing (6MWT). Significant nocturnal desaturation was considered as spending ⩾10% of sleep with SpO2 ⩽90%. We determine the prevalence of nocturnal desaturation and its frequency in those without resting or exercise hypoxia. Results: On overnight oximetry, 128 (73%) patients had oxygen desaturation to ⩽90% at any stage of the night. However, 73 (42%) had significant nocturnal desaturation (⩾10% of sleep with SpO2 ⩽90%). Mean minimum SpO2 was 84.0 ± 8.6% and fall in SpO2 was 11.4 ± 8.4%. Patients spent an average of 18.1 ± 26.9% of the night below 90%. On 6MWT, mean end SpO2 was 87.9 ± 7.5% and 6MWT distance was 325.4 ± 124.8 m. Sixty-two (50%) had oxygen desaturation to ⩽88% during 6MWT. Patients had a mean body mass index of 28.4 ± 6.7 kg/m2; TLco% 37.3 ± 16.6%; FVC% 66.3 ± 23.4% and SpO2 95.4 ± 2.5%. As demonstrated in the table, nocturnal desaturation was present in 49 of 149 (33%) patients without resting hypoxia and in 37 of 63 (59%) patients without desaturation on 6MWT. Conclusion: Nocturnal desaturation is frequent in ILD patients and is not uncommon in patients without resting or exercise-induced hypoxia. These results suggest that overnight oximetry is necessary to exclude significant nocturnal desaturation in ILD patients. Nocturnal desaturation is common in interstitial lung disease (ILD). In severe ILD, nocturnal desaturation can be attributed to the underlying disease. However, in less severe disease, nocturnal desaturation may be a marker for the presence of pulmonary arterial hypertension (PAH). It is possible that repetitive nocturnal hypoxia contributes to vascular stress and subsequent PAH. Aim: We study the association between nocturnal oxygen desaturation and disproportionate PAH in ILD patients. Methods: We reviewed 102 ILD patients (mean age 57.5 ± 12.7 years; 54 male) with overnight oximetry, pulmonary function and echocardiography during 2005–8. In order to study disproportionate PAH, we excluded patients with severe disease (TLco ⩽30%), in which PAH is not unexpected. We considered significant nocturnal desaturation as having SpO2 ⩽90% for ⩾10% of sleep. Evidence of PAH on echocardiography was considered as systolic pulmonary arterial pressure (sPAP) ⩾40 mm Hg and/or right ventricular dilatation or functional impairment. The association between nocturnal desaturation and markers of pulmonary vascular impairment was assessed. Results: Baseline parameters: On overnight oximetry, 41 (40%) had significant nocturnal desaturation. Mean minimum SpO2 was 85.2 ± 7.3%, and fall in SpO2 was 10.1 ± 6.9%. Patients spent 17.6 ± 26.3% of the night ⩽90%. Patients had a mean body mass index of 29.0 ± 6.1 kg/m2; 6-minute walk test (6MWT) end SpO2 90.7 ± 5.6%; 6MWT distance 345.9 ± 111.4 m TLco% 46.9 ± 13.8%; FVC% 73.8 ± 23.3%; composite physiological index (CPI) 44.9 ± 13.9 and SpO2 94.9 ± 2.6%. Analysis: Patients with significant nocturnal desaturation were more likely to have PAH on echocardiography (odds ratio (OR) 2.82, 95% CI 1.02 to 7.74, p<0.05) independent of disease severity as determined by CPI (OR 1.06, CI 1.01 to 1.11, p = 0.01). Patients with significant nocturnal desaturation had higher sPAP (p = 0.03), lower pulmonary acceleration time and lower PaO2 (p = 0.02). Pulmonary function (including TLco%, FVC% and CPI) did not differ in patients with or without nocturnal desaturation. Conclusion: In mild-to-moderate ILD, patients with significant nocturnal desaturation are more likely to have PAH, independent of the severity of their underlying disease. It remains unclear, however, whether nocturnal desaturation is implicated in the pathogenesis of PAH. Methods: Bronchoalveolar lavage cell pellet DNA was extracted from 15 patients with sarcoidosis (radiographic stages 1–4). Ten patients with systemic sclerosis and 10 patients with idiopathic pulmonary fibrosis served as disease controls. We used PCR targeting the majority of species in the Actinobacteria phylum, followed by sequencing to assess the type of ACT DNA when present. We also used 16S terminal restriction fragment length polymorphism (T-RFLP) to profile the background microbial community. Results: We amplified ACT DNA and obtained high quality score sequencing results in 87% (13/15) of sarcoidosis patients and 80% of the control patients. NCBI blast sequence analysis of the sequences revealed the presence of DNA from different non-tuberculosis mycobacteria (NTM) only in sarcoidosis specimens (7/13, 54%). Of these, 6/7 (85%) had radiological stages 0/I, and the other had radiological stage II. PA DNA was isolated in all three disease groups. A wide diversity in pattern profile, numbers and relative proportions was observed by T-RFLP analysis in the three disease groups. Conclusion: We observed the presence of NTM DNA only in patients with sarcoidosis, whereas the presence of PA DNA was not specific to sarcoidosis patients. Our results are compatible with the hypothesis of a mycobacterial cause for at least one form of sarcoidosis and the diversity of detected NTM suggest that more than one pathogenic agent may be implicated. Funding: This abstract was funded by Asmarley Charitable Trust, UK. Introduction: Although surgical lung biopsy is the gold standard investigation for the diagnosis of diffuse interstitial lung disease (ILD), it is not without risk and previous small series have suggested a mortality of up to 20%. To study this further, we looked at the outcome in all such cases undergoing lung biopsy referred to a large thoracic surgical unit serving a population of 2.5 million. Methods: We interrogated the comprehensive thoracic surgery database between April 2001 and April 2008 for all 224 patients (mean age 54.6 years (SD 13.7), mean FEV1 2.01 (0.85), mean FVC 2.54 (1.12), mean FEV1/FVC 75% (21.9), median NYHA dyspnoea score 2, 94 (42%) lifelong non-smokers, 55 (25%) current smokers, 23 (10%) significant asbestos exposure and 112 (50%) male) undergoing lung biopsy for ILD. Preoperative clinical and radiological information was available for 199 patients. Results: 185 cases were carried out via video-assisted thoracoscopic surgery and 22 converted to open biopsy. Average length of stay was 3.6 days (SD 3.59). Only 25 patients had complications and there were two deaths. Satisfactory tissue was obtained in all patients (see table), providing a primary diagnosis in 121 (54%), confirming a suspected diagnosis in 26 (16%) and a different diagnosis in 60 (27%). In particular, suspected malignancy was refuted in 13, confirmed in five and unexpectedly diagnosed in five cases. Discussion: Surgical lung biopsy is extremely effective and safe in the investigation of ILD, and should be considered routinely when simple tests have failed to yield a diagnosis. Furthermore, the results may alter management in a high proportion of patients. However, the low complication rate should be interpreted with caution as it may be the result of careful patient selection. Introduction: Sarcoidosis, with its pathological hallmark of granulomatous inflammation, has a predilection for the lungs and the pulmonary vasculature. Pulmonary hypertension (PH) affects 6–10% of general sarcoidosis cohorts, an incidence that rises with worsening lung disease. A number of pathogenetic mechanisms for PH have been proposed, from large vessel obstruction to granulomatous obliteration of the interstitial circulation, microvascular injury and cardiac sarcoidosis. We sought to describe the frequency of PH and its relationship to lung function impairment and disease phenotype in this disease. Methods: Demographic, radiological and physiological (pulmonary function, echocardiography and right heart catheter) datasets were constructed for comparison. High-resolution computed tomography (HRCT) allowed the pulmonary manifestations to be categorised into fibrotic and non-fibrotic subtypes. Resting lung diffusion capacity for carbon monoxide (DLCO) and its derived transfer coefficient (KCO) were obtained. Pulmonary artery systolic pressure (PASP) was estimated by transthoracic echocardiography (TTE) using the Bernoulli equation. When possible, TTE and lung function measurements were taken within 3 months of each other. Results: 32 patients (21 women, median age 59 years; 11 men, median age 54 years) were identified. 11/32 (34%) had HRCT features of fibrotic lung architectural distortion. Among patients with detectable tricuspid regurgitation (18/32, 56%), PASP was measured in 16/18 (89%). Overall, 6/18 patients with TR (33%) had evidence of PH on echo as defined by PASP >40 mm Hg. Within this subgroup, parenchymal fibrosis was evident in a third of cases. In patients in whom both PASP and DLCO were measured (n = 14), the coefficient of determination (r2) between the two indices was −0.11. The inverse correlation between PASP and KCO produced r2 = 0.28. Median values for PASP and percentage predicted DLCOc and KCOc were 27 mm Hg, 58% and 91%, respectively. Conclusion: In this preliminary analysis of patients with pulmonary sarcoidosis characterised in anatomical and physiological terms, PASP correlated poorly with indices of gas transfer. The weak association between gas diffusion measurements and echo-estimated pulmonary arterial pressure suggests that complex interactions govern the process of granulomatous lung damage and vascular remodelling. Specific mechanisms of sarcoid vascular pathogenesis await detailed characterisation. Background: Pulmonary arterial hypertension (PAH) is increasingly recognised in patients with diffuse fibrotic lung disease and is associated with increased mortality. Cardiac output (CO) is an important prognostic marker in PAH. Non-invasive CO assessment with inert gas rebreathing methods have been validated in patients with PAH,1 2 but not in PAH associated with parenchymal lung disease. Inert gas rebreathing measures of CO may be less accurate in patients with lung disease because of intrapulmonary shunting and/or incomplete gas mixing. Aim: This study aims to determine the accuracy of an inert gas rebreathing measure of CO in patients with diffuse fibrotic lung disease. Methods: Twenty consecutive patients (10 men, mean age 59 ± 12 years) with fibrotic lung disease referred for right heart catheterisation (RHC) underwent non-invasive CO assessment. Fick’s method was used to calculate COFICK at RHC. COINNOCOR was measured within 24 h of RHC with an inert gas rebreathing technique (nitrous oxide and sulphur hexafluoride) with rapid photoacoustic spectroscopic analysis (Innocor; Innovision, Denmark). 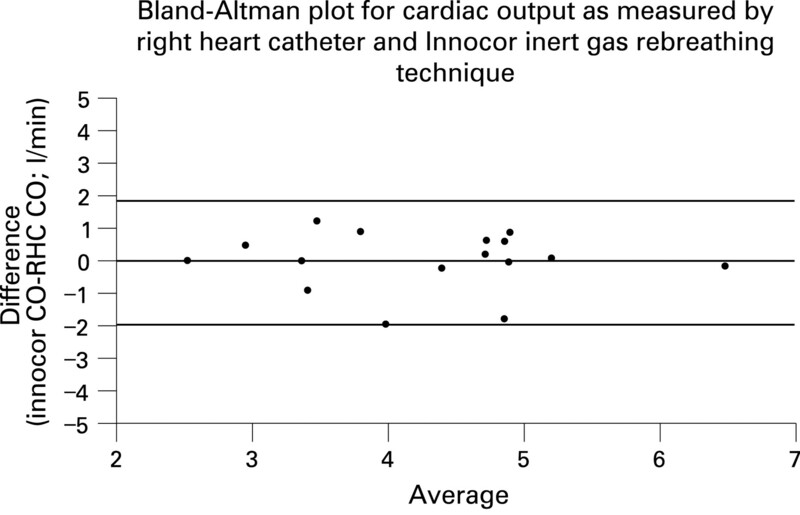 The relationship between invasive and non-invasive measures of CO was assessed by correlation and Bland–Altman analysis. Results: 13 of 20 (65%) had PAH on RHC: mean pulmonary artery pressure 27.2 ± 10.0 mm Hg; pulmonary vascular resistance 5.2 ± 3.5 Wood’s units. Patients had fibrotic lung disease, including idiopathic pulmonary fibrosis (n = 8), non-specific interstitial pneumonia (n = 8), chronic hypersensitivity pneumonia (n = 2) and other (n = 2). Baseline parameters included: mean TLco 24.8 ± 8.4%, FVC 67.6 ± 22.1%, right ventricular systolic pressure 56.7 ± 19.4 mm Hg and BNP 8 (5–234) pmol/l. There was no evidence of systematic bias, as judged by Student’s paired t test: mean COFICK 4.1 ± 1.1, mean COINNOCOR 4.0 ± 1.3 l/min (p = 0.61). There was a strong positive correlation between COFICK and COINNOCOR (R = 0.74, p = 0.001). Bland–Altman analysis revealed a mean difference of 0.11 ± 0.89 l/min (limits of agreement −1.69 to +1.91) (see fig). Conclusion: In patients with diffuse fibrotic lung disease, cardiac output can be accurately and non-invasively measured by the Innocor inert gas rebreathing device. This may be important in the non-invasive assessment of PAH in these patients. Introduction: Diffuse pulmonary fibrosis (DPF) is associated with a relatively poor prognosis and median survival of only 2–3 years. Over 50% of cases remain idiopathic. DPF has a male predominance with a 3M : 2F prevalence ratio, suggesting genetic or environmental factors may play an important role. Occupational history often distinguishes men from women; particularly occupational exposure to asbestos. We currently recognise asbestos as a cause of DPF in the context of a heavy exposure history. Aim: To assess whether asbestos exposure of any degree may account for the excess number of male cases of DPF. Methods: We surveyed a population of 421 patients with interstitial lung disease (ILD) presenting consecutively over 12 years to one consultant within our department. 92% of relevant records were available. 253 cases of ILD with specific characteristics such as sarcoidosis, extrinsic allergic alveolitis, drug reactions, collagen vascular disease and other rare entities were excluded. We examined the records of all remaining 168 patients with DPF (comprising idiopathic pulmonary fibrosis, idiopathic interstitial pneumonias and fibrosis provisionally attributed to chronic aspiration or a pneumoconiosis). Asbestos exposure was graded as trivial (no recognised exposure or minor background exposure) or appreciable (definite exposure history, regardless of extent). Results: There were 120 men and 48 women (5M : 2F) with DPF. 75 men and three women (25M : 1F) had DPF associated with an appreciable history of asbestos exposure. 45 men and 45 women (1M : 1F) had DPF and only trivial asbestos exposure. Discussion: The excess number of men with DPF in this survey is matched by the excess number of men with a history of asbestos exposure judged to be more than trivial. If this link is causal, the excess of DPF affecting men may be attributed to asbestosis. This is against general consensus that a diagnosis of asbestosis can only be made with a history of substantial exposure. Conclusion: We hypothesise that asbestos exposure is causally linked to many more cases of DPF than is currently accepted.